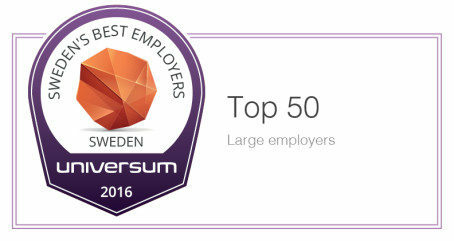 The annual Sweden’s Best Employers ranking is conducted by Universum, the most popular job portal in Sweden. The ranking focuses on employees’ assessment of their current employer in three aspects: internal identity, satisfaction, and loyalty. The scores given by employees are totaled to determine best employers out of 3,000 companies nominated yearly in over 57 markets. A high score in the ranking indicates beneficial employment conditions in the company and its ability to attract top talent. After five years of participation, Sigma Technology has reached an outstanding result – 11th place in the listing. Compared to the 40th place occupied last year, this is a big stride for our company and we want to thank our employees for this high mark. We strive to provide our employees with superior employment conditions. For this end, we ensure open dialogue and trustful relationship between consultants and managers and engage our employees in challenging projects based on cutting-edge technologies. Just as importantly, we give our employees an opportunity to contribute to a better tomorrow. Together we build a better future for schools in South Africa in terms of the Star for Life project. For more information, contact Carl Vikingsson, carl.vikingsson@sigmatechnology.se. Sigma is owned by Danir AB and has about 3,000 employees and a network of partners in 11 countries.